Obelisks of the Language Monument in Paarl, Western Cape, South Africa. The Afrikaans Language Monument (Afrikaans: Afrikaanse Taalmonument) is the only monument in the world dedicated to a language. It is on a hill overlooking the Teachers' Training College in Paarl, Western Cape Province, South Africa. Completed in 1975, it was built to celebrate the 100 years birthday of Afrikaans being declared as a different language from Dutch. 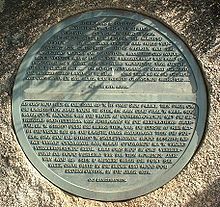 On a large inscription at the entrance, two quotes from important Afrikaans poets are written. "Afrikaans is the language that connects Western Europe and Africa... It forms a bridge between the large, shining West and the magical Africa... And what great things may come from their union – that is maybe what lies ahead for Afrikaans to discover. But what we must never forget, is that this change of country and landscape sharpened, kneaded and knitted this newly-becoming language... And so Afrikaans became able to speak out from this new land... Our task lies in the use that we make and will make of this gleaming tool..."
The phrase "DIT IS ONS ERNS" ("we are earnest [about this]", or "this is our earnestness") is inscribed on the pathway leading up to the monument.